Pearl Azure latex balloons, perfect for any occasion either on there own or part of a display. Pearl Azure latex is lovely tone of blue used for any events. The Pearl Azure is used for all events from wedding's & anniversaries to birthday's & baby showers. The Pearl Azure is used for any occasion or event, is a lovely blue which can be used for many themes and is a very popular colour. 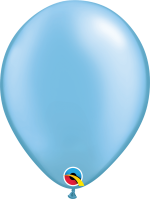 Can be used for helium purpose or air.